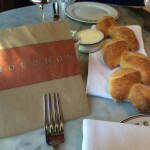 Continuing our tour of Thomas Keller restaurants, we decided to lunch at Bouchon, which is Keller’s take on the French bistro. We had reservations for a late lunch and were promptly greeted and seated. Decor was typical bistro, with round marble top tables and Parisian style chairs. 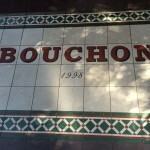 A small patio offers outdoor dining, although during the hot summer days, I would advise an inside seat. Evenings would probably present a better outdoor dining experience. The menu featured typical bistro fare, including salads, small bites, and simple entrees. 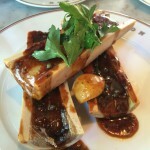 We decided to order some traditional fare: Salmon Rillettes, French Onion soup, roasted bone marrow, and Croque Madame. Rilettes is spread meant to be eaten with toast. 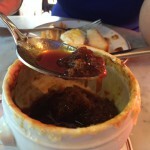 Similar to pates, they are made by slowing cooking a type of meat slowly in fat, which in this case was butter (I admit, I had to look this up on Wikipedia to know exactly what rillettes was, but how figured, how can I go wrong with something that is like pate and basically loaded with butter?). 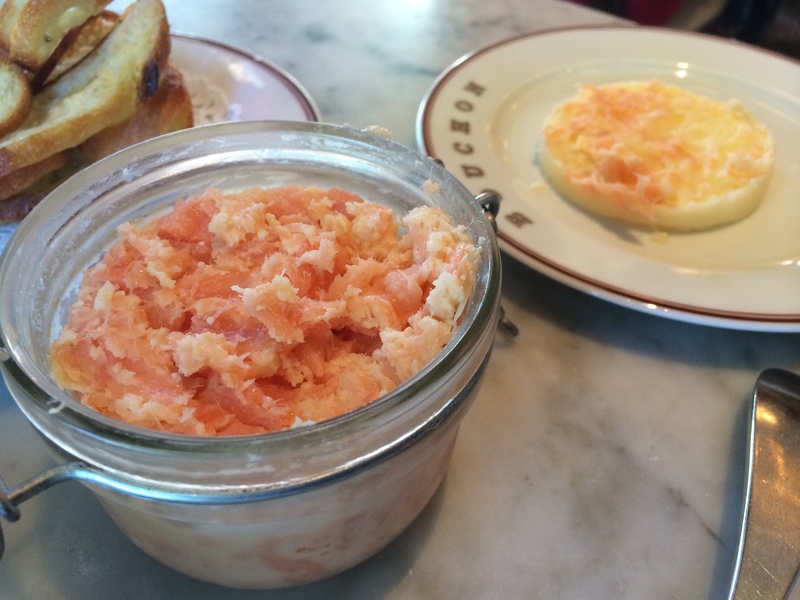 Bouchon’s version includes both smoked and fresh salmon and comes in a small mason jar. 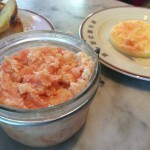 When presenting the jar at the table, the server opened mason jar and used a knife to remove the large disc of solidified butter on top (see top left hand side of picture above). Our server asked if we wanted to keep the disk, and I figured, keeping it would give us some butter to spread on the toast or house bread. The rillettes were a bit salty for my taste, probably as a result of smoked salmon, so using a little bit goes a long way. Mixing a bit of the butter from the disk helped dilute the saltiness a bit, but overall would probably skip this in the future. 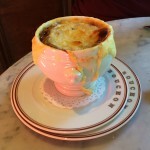 A true test of a French bistro is its French Onion soup, and Bouchon’s does not disappoint. 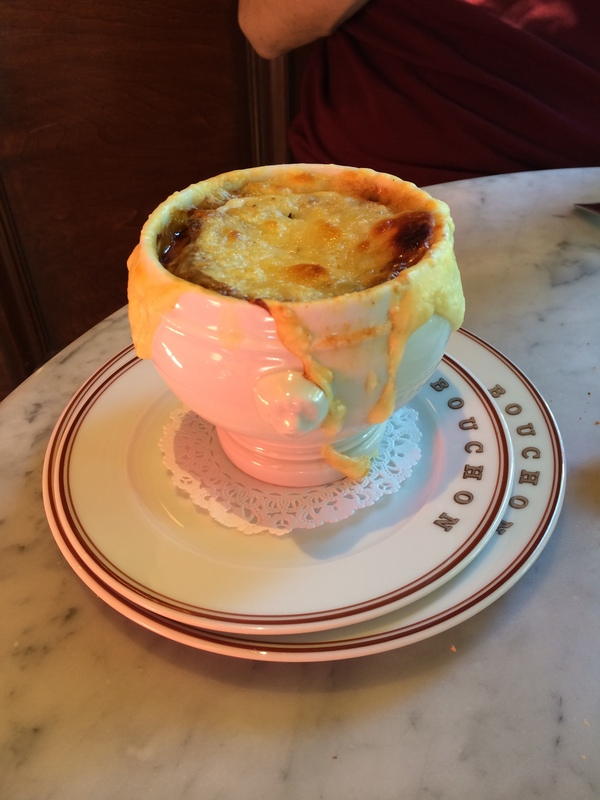 Served in a proper vessel. Yes. Baked cheese on top. Yes. 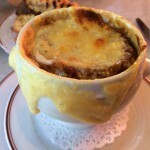 Uses runny, stringy cheese (gruyere or emmental is my guess??). Check. Crouton in the soup. Check. Soup base not a salt bomb. Check. 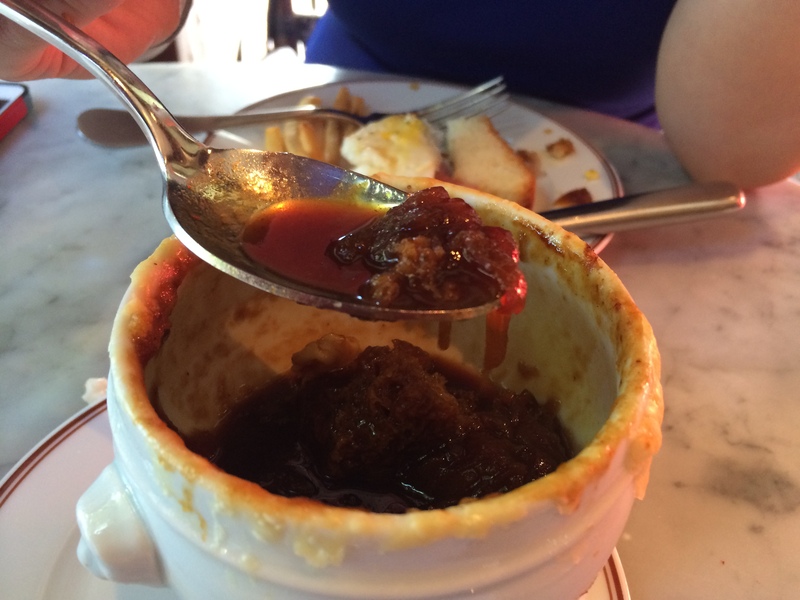 The flavor of the soup base was very rich, and almost had a syrup like consistency, which leads me to believe it had been heavily reduced from a beef or even veal stock. Not overly sweet either. Portion was perfect too with all the elements working well together. We have had roasted bone marrow at other places, most recently at The Beast and The Hare. 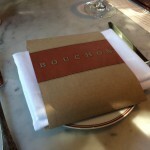 Bouchon’s version is by far the best we have had. 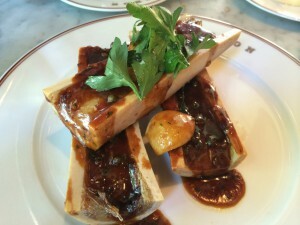 Nicely balanced, rich, fatty, and silky smooth, with just a hit of acid to cut the richness of the marrow. 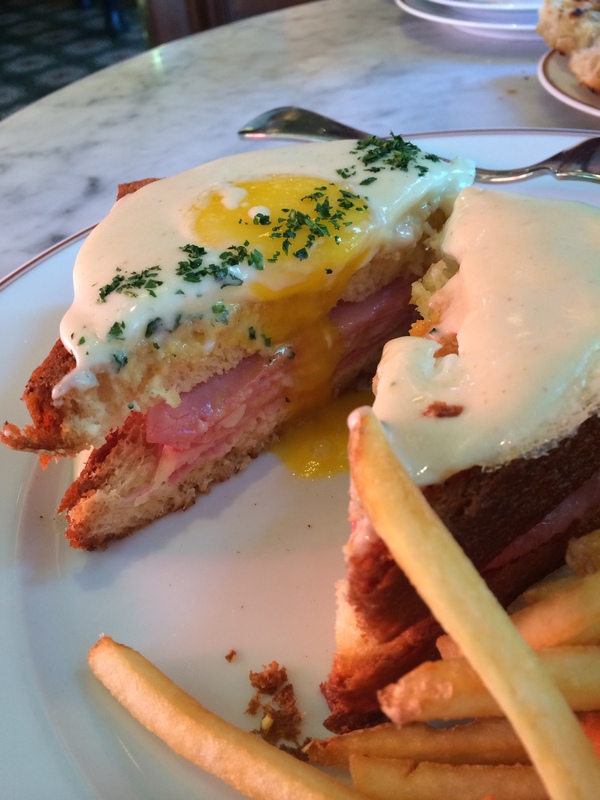 This is a dish i would travel back for over and over again. Perfectly cooked and seasoned. In fact, we were tempted to over a second plate, but decided against it, as we had already ordered a lot of food. 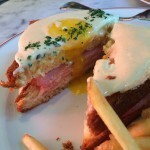 The bread used is a brioche (house made I assume) and the sandwich is topped with a soft fried egg and Mornay sauce. While I appreciate the high quality ingredients and skilled preparation, the dish fell into the “nothing special” category for me and was missing a wow factor, although Bouchon’s version did stay pretty close to the spirit of a proper Croque Madame. 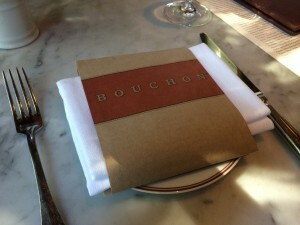 If you are looking for an authentic French bistro experience, then Bouchon delivers. 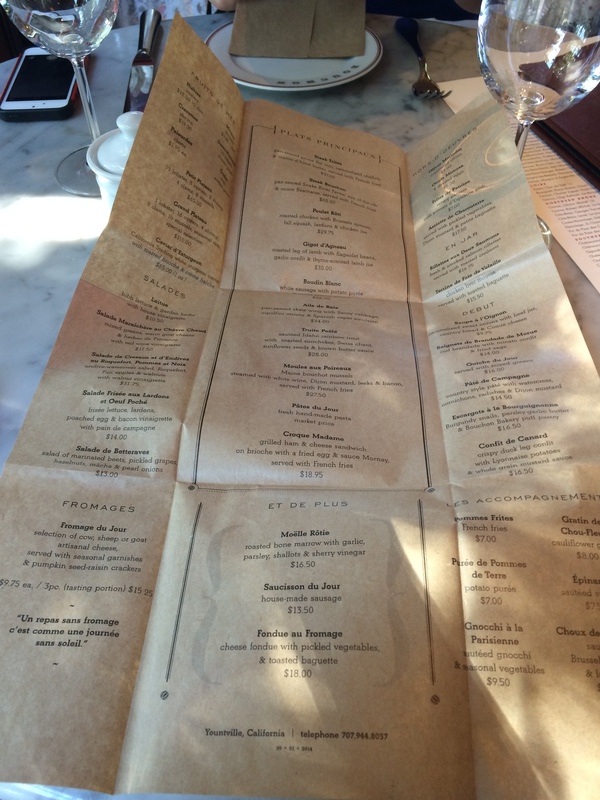 Food is high quality and is reasonable (for the Napa area that is). Great for a couple or small groups. 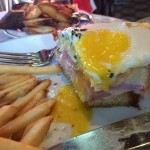 The rillettes and Croque Madame were a bit disappointing to me, but not enough to damper my desire to return and try different items on their menu, after I order the bone marrow of course. Easy call. 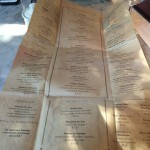 Must visit if you are in the Napa Area. 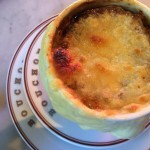 Raise if you are a fan of French bistro food.